A deckchair can be such a boring piece of beach or garden furniture. But take an old one, strip off the dull fabric, repair and treat the frame and fit a fabulous fabric, and you have a deckchair that’s practically a work of art. We’re always on the lookout for that odd item that can be given a completely new identity with some careful restoration and crafty upholstery. 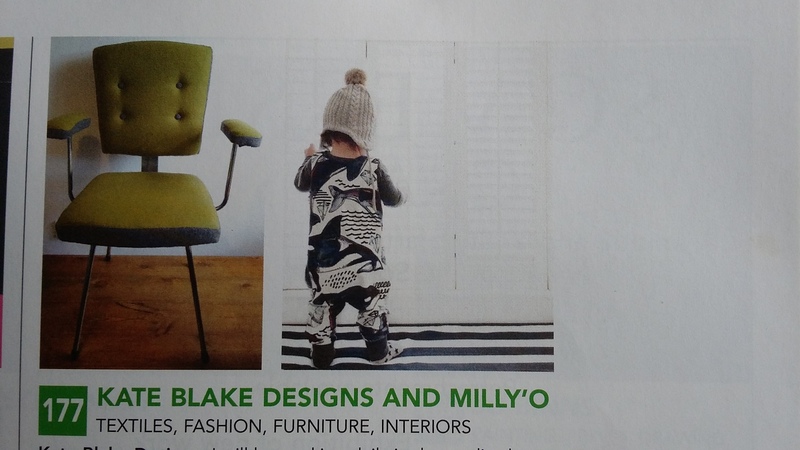 If you’re looking for a combination of upholstery and artistry, then Kate Blake Designs is where you’ll find it. From beautifully refurbished chairs and highly individual footstools to one-of-a-kind deckchairs and quirky antiques, Kate Blake Designs will transform the dull and ordinary into the vivid and exciting. 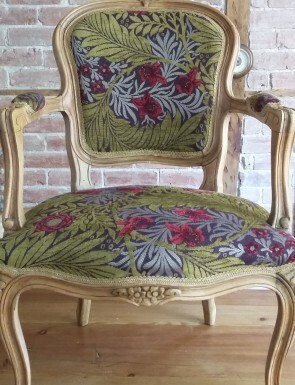 Using traditional techniques and vintage fabrics, we can give new life to your tired furniture. In our online shop you’ll discover a range of highly individual pieces we’ve rescued from boot sales, flea markets and junk shops then restored to create exclusive furniture and furnishings for your home and garden. Please note that this website is not secure for any payments.Should you wish to pay for a product please contact Kate directly : email: kate@kateblakedesigns.com or mobile: 07967900004 to make arrangements. Thank you. We often come across an item that we can find a new use for – for example, a fishing box transformed into a storage stool. They make stylish talking points around the home, and as each one is unique none of your friends will have anything quite like it. We’re always on the lookout for that odd item that can be given a completely new identity with some careful restoration and crafty upholstery. They’re items with pedigree and class, and interior designers love them. Take a look at our online store to see what you can find. A good quality dining chair can last a lifetime, particularly if it’s had some TLC to help it through its mid-life crisis. We can completely restore a set of much-loved dining chairs, or even that lovely singleton standing in your hall or bedroom. From the woodwork to the upholstery, Kate Blake Designs can breathe new life into your dining chairs, while ensuring that they retain the character and charm you love. 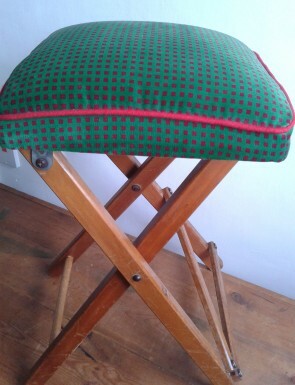 Footstools can make lovely, unusual gifts, particularly when they’re a touch on the quirky side. 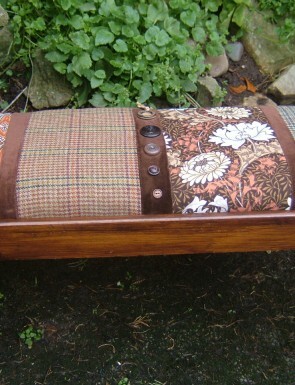 We are constantly on the prowl for quality items that can be transformed into unusual footstools. We usually cover them in vintage or recycled materials like tweeds and woollen fabrics, which means that every one we make is unique. You’ll often find a selection of highly original and very desirable footstools in our online store. 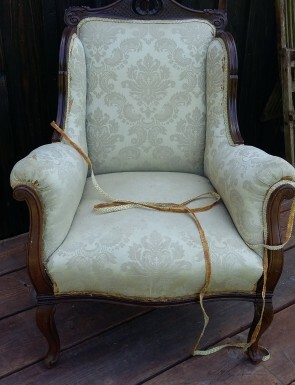 You only have to look at the before and after pictures to see how a tired chair can be saved from the skip and restored. Where most people see only dilapidation, we see potential. The most sorry-looking chair can be given a whole new lease of life when it’s been transformed by traditional upholstery techniques and materials. 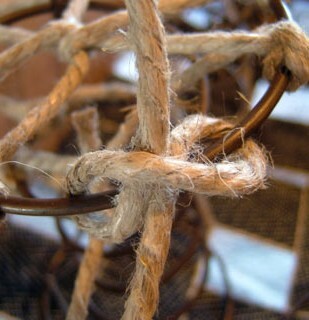 If you have a much-loved chair that’s seen better days we can strip it back to its frame and, if necessary, repair this before replacing the springs, fitting new webbing, shaping wth fibres and wadding then recovering in a beautiful material. 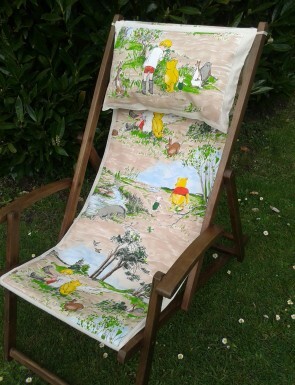 A deckchair can be such a boring piece of beach or garden furniture but take an old one, strip off the dull fabric, repair and treat the frame and fit a fabulous fabric, and you have a deckchair that’s practically a work of art. We try to use vintage deckchair frames, which we search for at boot fairs and flea markets. Where possible we also use vintage fabrics, which are padded and reinforced with calico or even recycled jeans! All our deckchairs have matching cushions and come with a plastic cover. You’ll find some of our latest creations in our online shop. If you would like us to make a deckchair in a special design, please get in touch.